Purchasing your first home can be one of the most exciting and rewarding milestones one can experience. Shortly after the keys are handed over, personalizing your home to reflect such a milestone becomes second nature. Don’t stress! Creating an inviting, comforting and welcoming abode can come with ease with these great tips! Clean house at the old place.This first step will not only make your new home easier to decorate, but it will put you miles ahead during move-in. Be realistic and rid yourself of any unnecessary belongings. This is the perfect time to start over. Have a garage sale, auction it off on eBay or donate it to charity. You’ll be amazed at what you won’t miss. Start with the bedrooms.This is where you’ll be spending almost a third of your time when you’re at home. If you’re on a tight budget, opt for new bedding first! If you have a little more money, paint the bedroom walls to complement your new bedding. Add coordinating window treatments to help with lighting and cooling. Tip: Your decor should mirror your personality, fit your room comfortably and it will stay with you for years. Don’t buy everything at once. Prioritize items that you will need on a daily basis. If you need to make splurge-worthy purchases, make sure big-ticket items such as appliances, mattresses and bedroom sets are among the selection. Think need above want when it comes to decorating. Don’t be afraid to mix and match. Retail stores love to decorate displays with everything matching. They would love for you to buy everything in sets, but don’t do it! A few pieces with the same styling are fine, but any more than that and your home will have the generic look of a furniture showroom. Make sure your own personal style shows through! Tip: Top priority should be proportion, scale and balance of your furniture and accessories within each room. Tie-in everything together with color. Just because you are going for a blue-theme in your living room, doesn’t mean you have to have blue walls, blue ceilings, etc. Pick an accent color that draws everything in and that complements nearby rooms. Tip: Choose a color that you will not get tired of easily and ones that are not overpowering. 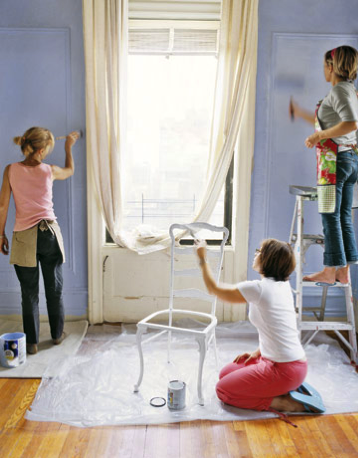 What are some helpful decorating tips that have worked for you?